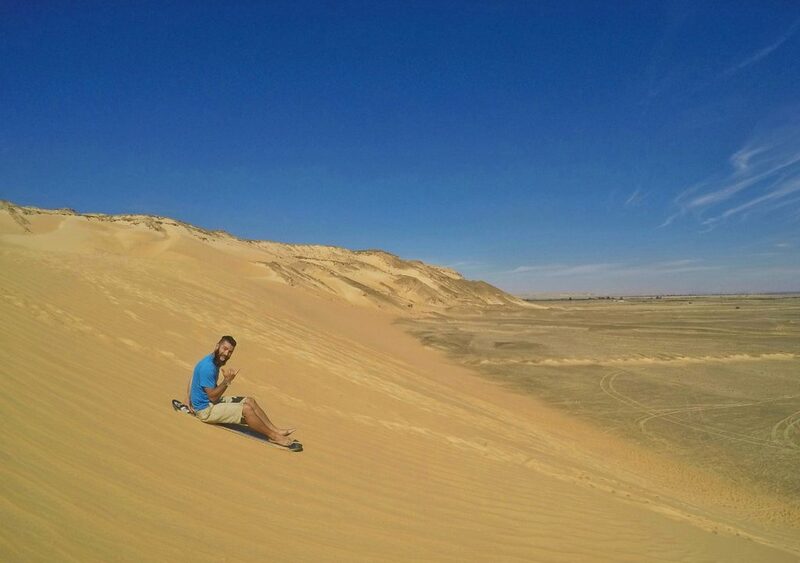 While backpacking through Egypt, I always wanted to go far out into the desert and see what the Sahara is all about. I read about the desert oasis’ with palm trees and hot springs. 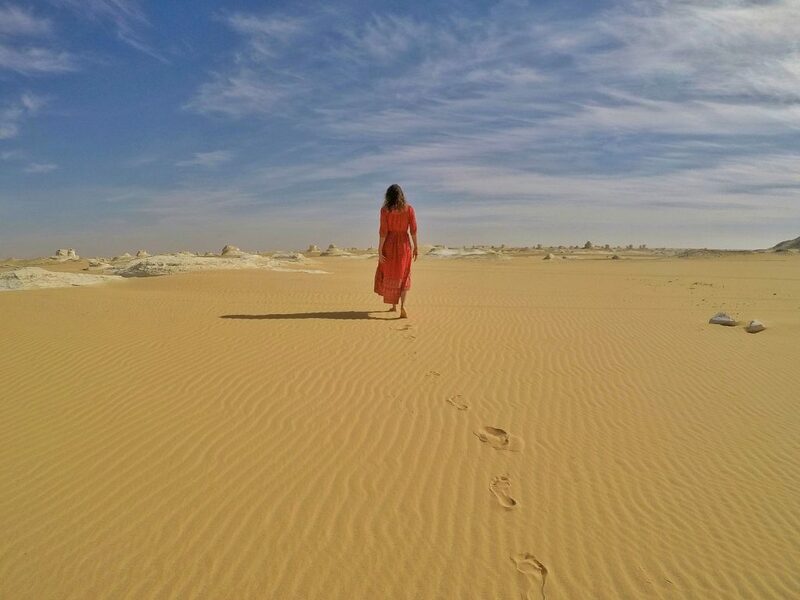 So we asked around, and the Siwa Oasis was only open for day visitors and restricted for visitors, and then we were told the Bahariya Oasis, also known as the White Desert, is closed for tourism. Struggling to figure out what to do, we kept asking around. Others told us the White Desert was possible. 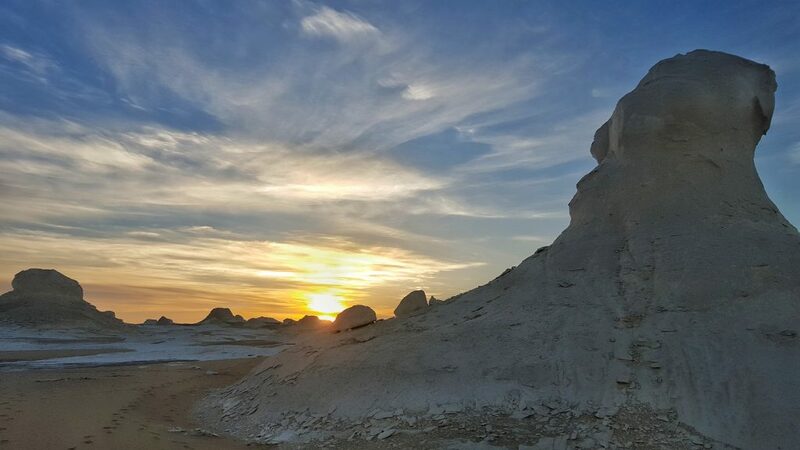 Confused, we called a few other tour operators to ask and determined that the government has officially shut down the White Desert for tourism when accessed from Cairo (Bahariya), however, it is open for tourism if accessed from Farafra, the route in which nearly nobody takes. Several guides told us, however, we could still get in. This was Egypt. So we went. A half day of travel and we arrived with a group of locals to Bawiti, the heart of the Bahariya Oasis. From here it is where our tour began. 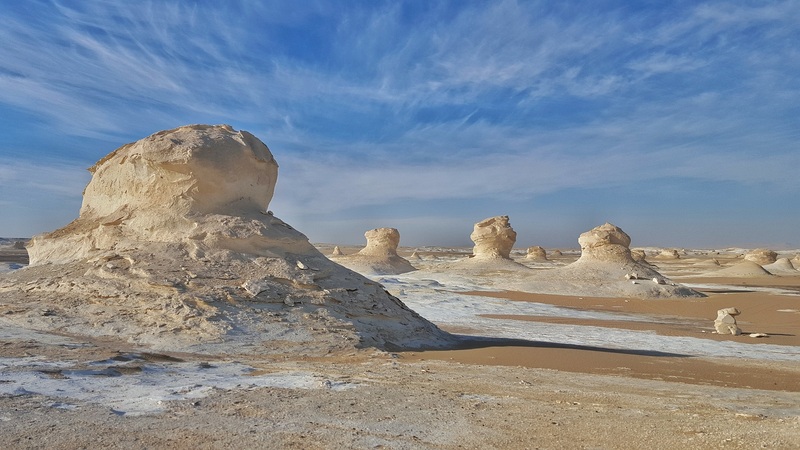 While the pyramids and temples may be the main attraction; however, don’t miss out on one of Egypt’s most impressive landmarks, the White Desert. This was one of our most memorable adventures in Egypt. Falling asleep beneath the stars each night and waking up with nobody around, ready to explore amazing sandstone formations was a highlight of our trip. With over nine months of travel in Africa, we had been to several deserts at this point in our trip. 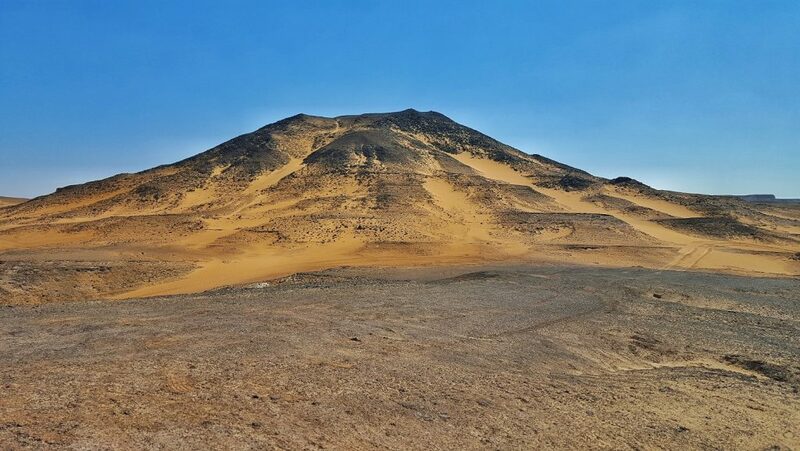 Besides the Namib Desert in Namibia, the White Desert in Egypt is our second most favorite desert and picturesque desert in Africa. 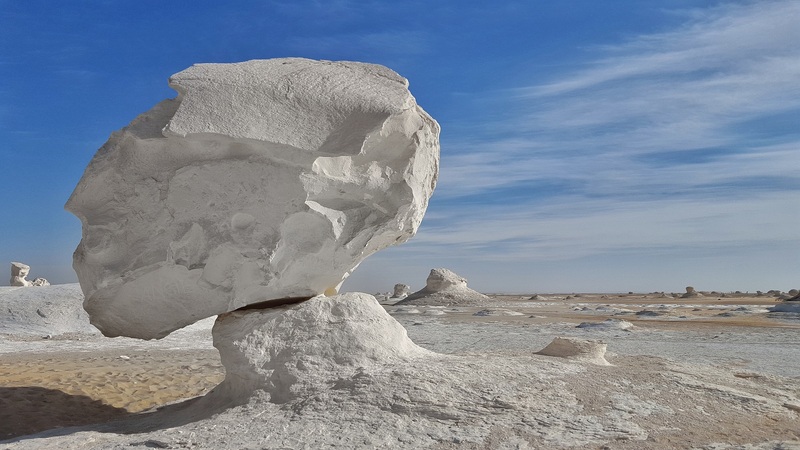 Tours to the White Desert start from Bawiti. Located next to the Bahariya Oasis, this town is one of the largest in Western Egypt. Tours are either two or three days. The best way to experience this region is on the full three-day tour. Two nights are spent sleeping under the stars Bedouin style. 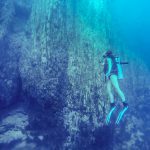 The tour is a great combination of different sites, from a salt lake, hot springs, desert oasis, the Black Desert, and of course, the White Desert. 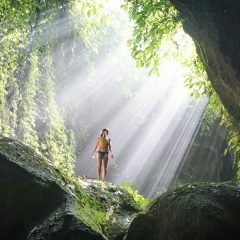 Most tours will cater to what you want to see. We recommend spending as much time as you can in the White Desert, the clear highlight of the trip. Private car – car hires can be arranged by tour guides in Cairo or in Bawiti. It is also possible to go to the microbus station and get in a private taxi with four or five people. Cost can range from 90 E£ (per person) to 300 E£ (per vehicle). Microbus – From Moneib Station (Giza metro line 2), it is a ten minute walk to the microbus station. Turn left outside of the station and continue straight until a large highway overpass. On the left side of the street underneath the overpass is where you will find a small microbus station. This is the only station with a direct bus to Bawiti. Cost is 80 E£ per person. Tourist bus – large tourist buses leave from Turgomen Station in Cairo. Upper Egypt Bus Company departs at 7 am, 10 am, and 3 pm to Bawiti. When the White Desert was “closed,” these buses were running irregularly. However, we were told specifically to not take a tourist bus. Military Police stop the tourist buses to get passport info, and would apparently warn tourists to not enter the White Desert. We took the Microbus and never got stopped by the police. Cost is between 70 E£ and 100 E£. Tours can be booked from Cairo or by contacting local tour guides in Bawiti. Many operators based in Cairo are just a middleman, booking a tour for a guide located in Bawiti. I always try to book directly with the guide, not only to get ourselves a better price, they often get more money out of it that way. Prices were all over the place. I am not sure if some are more “luxurious” than others, but they all sounded the same, however, some tours were triple the price of others. It is possible to show up in Bawiti and find a local tour guide. This allows you to personally meet the people involved and see the quality of vehicle before any payment has occurred. After hours of research and speaking to dozens of tour guides, we booked with a local guide in Bawiti. He did not ask me to promote his business, but I honestly have to. He was incredible. Our guide was a man named Hamada Kaddora. Based in Bawiti, Hamada speaks fluent English, and has 15 years of experience in desert tours. The tour he took us on is top-notch, with excellent Bedouin food. His contact is +20 100 2565934. 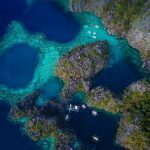 Cost: Prices start from $125 USD per person for 3-day tours. Prices can vary based on tour specifics. Black Desert – drive through the black desert and a quick stop at a viewpoint to take in the odd-looking colors. Safety in Egypt is a concern and there is no way to avoid this topic. Facts speak for themselves. One of the 2015 events was directly related to this region. Several tourists were on tour in the Western Desert. They went off track and unfortunately were in the same vicinity as a terrorist and kidnapping situation. The Egyptian military mistakenly killed 12 tourists. Since this occurred, most of the Western Desert including trips to the White Desert and Siwa Oasis is closed. Siwa was still closed for overnight visits as of mid-2017. White Desert trips are allowed, yet there are occasional issues with the military stopping all visits to the desert. This was a horrible tragedy that has led to a huge decrease in tourism. Our visit to the desert went smooth and without any issues. We did not feel threatened or harmed in any way. 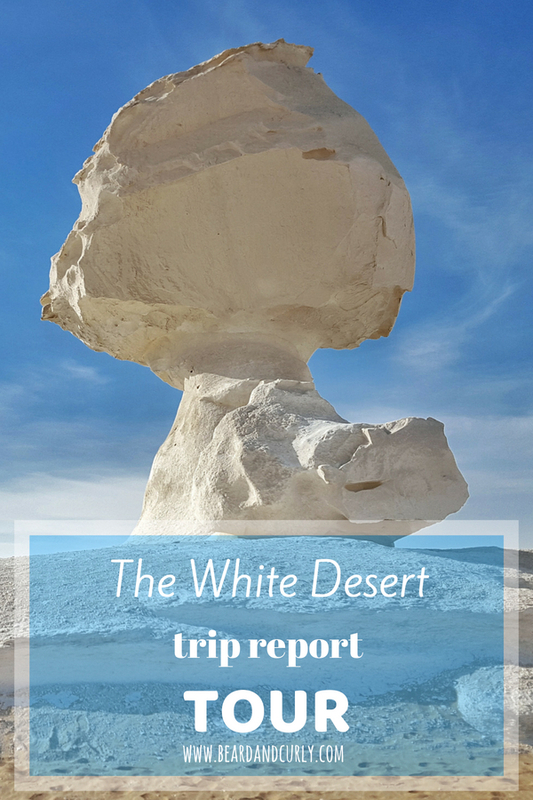 We recommend to check with locals on the situation as it can change, but in late 2016 it was safe to visit the White Desert.